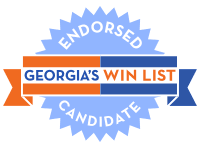 Georgia’s WIN List Endorsed Candidate for Lieutenant Governor is Sarah Riggs Amico. Sarah is a proud business owner of Jack Cooper Holdings Corp., employing thousands of union truckers and mechanics as the largest over-the-road transporter of light-vehicles in both the U.S. and Canada. She is a wife, a mother, and believes that there’s no problem we can’t solve if we work together. Sarah is a product of a public school education, which successfully prepared her to go on to earn her degrees. Sarah graduated from Washington & Lee University with a B.A. in Politics with honors and earned her M.B.A. from the Harvard Business School. She chooses to send her own children to public schools in Cobb County because she believes in Georgia’s public education system. She believes that all our children should have the opportunity to reach their potential. Sarah has spent her career solving problems people thought were not fixable. She strived to make smart investments in her workers at Jack Cooper and to show that doing the ‘right thing’ is the best way to create growth. She will do the same for Georgians – whether red, blue, or purple. She believes that we all deserve better than career politicians offering excuses for unimpressive results. Sarah intends to increase access to affordable healthcare in Georgia. She believes every Georgia child should have a quality education regardless of their zip code. And she will work for an efficient government that cuts ineffective programs and bureaucratic red tape and taxes. She will strive to develop better job opportunities for all Georgians. To follow Sarah more closely, find out more about her campaign, make a donation or volunteer, contact the campaign below. Georgia women like Sarah are making history in this midterm election cycle as they run for seats long held by Republicans. With women in record numbers on the ballot this year, WIN List needs your help to elect these women and train the candidates we want to see on the ballot in 2020 and beyond.